The three types of faults are Normal Faults , Reverse Faults , and Strike-Slip Faults . 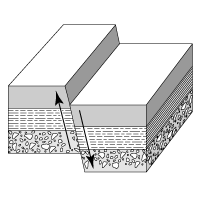 Shear stress is associated with which fault type? Transform plate motion creates what type of major fault? Which fault shown below forms under tensional forces? Which fault shown below forms from compressional forces? Divergent plate motion creates what type of major fault? Convergent plate motion creates what type of major fault? Tha San Andreas fault is a famous strike slip fault located in California. 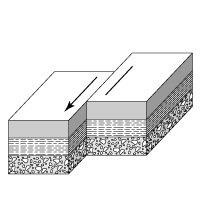 Which diagram depicts a strike-slip fault? The San Andreas Fault is a example of a Strike-Slip Fault . a strike-slip fault where the angle is less than 55 degrees. a reverse thrust fault that has a dip of 45 degrees or less. 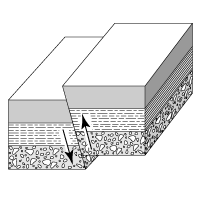 angle of faulting and displacement distance. formation depth and direction of movement. direction of movement and angle of faulting. displacement distance and formation depth.